Jeep and Mopar have teamed up to develop a variety of concepts that will make their debuts at the annual Easter Jeep Safari in Moab, Utah. Now in its 51st year, the Easter Jeep Safari is attended by thousands of die-hard 4x4 enthusiasts looking for some serious off-roading. And for the show, an array of production and prototype Jeep Performance Parts were used on this year’s collection of concept vehicles. The 2017 Easter Jeep Safari concept vehicles include: Jeep Grand One, Jeep Safari, Jeep Quicksand, Jeep Trailpass, Jeep Switchback, Jeep CJ66 and the Jeep Luminator. The Jeep Grand One celebrates the 25th anniversary of the Grand Cherokee with a modernised spin on the original 1993 ZJ. Featuring custom 18-inch lace-style wheels with 33-inch BFGoodrich Mud-Terrain KM2 tyres, high-clearance wheel arches, an extended wheelbase, trimmed fascias and a wood grain treatment on the body, the Grand One concept is powered by a 5.2-litre V8 engine, mated to a four-speed automatic transmission. Its front and rear axles are equipped with selectable locking differentials and a 2-inch suspension lift. Inside, the interior continues the celebration of the original Grand Cherokee with 90s-inspired materials and touches, a durable bed liner applied to replace the carpet and accessorised with an old-school car phone. The family-focused Jeep Safari concept is all about ‘bringing the outdoors in while keeping the doors and roof on’ - with a special emphasis on giving the backseat passengers a great view. The high-tech, Wrangler-based concept features a translucent hard-top roof panel, two-level aluminium cargo rack with incorporated drone, a raked windshield, boatsided rocker panels, LED headlamps, and custom LED tail lamps and parking/turn lamps. The Safari’s unique “windoors,” made of lightweight aluminium and clear vinyl, are hinged so that they open like a cabinet, making the entrance to the vehicle particularly unique. The doors features a zip opening to let in fresh air. Inside, the two rear bucket seats are rotated outboard, making it easier for rear seat occupants to view out the side of the Safari, and the custom interior includes an instrument panel-mounted iPad, adding to the high-tech vibe. Overall body length has been reduced to make the Safari more nimble on the trails. Powered by the 3.6-litre Pentastar V6 engine, mated to a five-speed automatic transmission, the Jeep Safari also includes 35-inch BFGoodrich Mud-Terrain KM2 tyres on custom 18-inch wheels, custom full-length skid plates, steel front and rear bumpers, integrated on-board air system, upgraded brakes and unique cold air intake. Created for 'enthusiasts who love the sand life', the Jeep Quicksand is a loud, fast and fun hot rod. The Quicksand concept is powered by a Mopar 392 Crate HEMI engine with eight-stack injection, mated to a six-speed Getrag manual transmission. A “peekaboo” cutout in the hood and gasser-style downturned open headers add to the vintage hot rod feel. Inside, the minimalist interior features red accents, two front low-back bucket seats, flat aluminium door panels, tilt-out windshield glass and a chrome roll bar. While the Quicksand was made for wheeling in sand, its off-road credentials ensure that it is fully capable in any terrain. Its staggered tyre setup features 32-inch BFGoodrich Mud-Terrain KM2 tyres in the front and 37-inch BFGoodrich Mud-Terrain KM2 tyres in the rear, and coilover shocks, all on 18-inch vintage “kidney bean” alloy wheels. The Quicksand concept also features a Warn winch concealed in a front-mounted Moon tank and a recovery rope is located in the rear, replacing the traditional drag racer’s parachute. 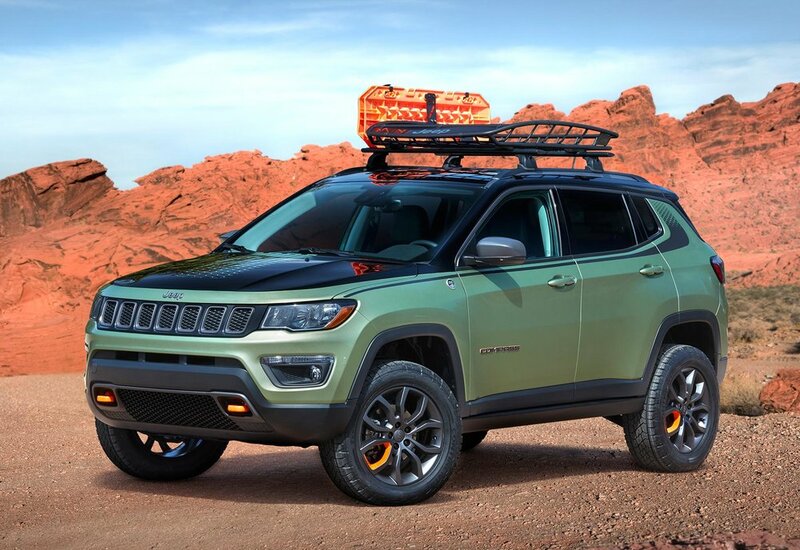 Based on the new Jeep Compass, the Jeep Trailpass concept vehicle takes the Compass Trailhawk a step further for an extreme off-road adventure. The Trailpass exterior features Gloss Black side mirror caps, a custom hood graphic, side stripes, tinted headlamps and tail lamps, and a Mopar/Thule roof basket with roof bag and traction mats. 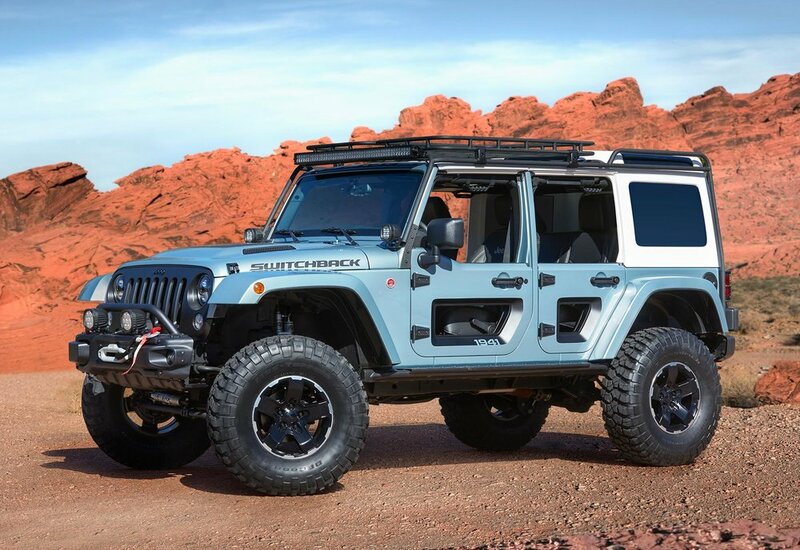 The Jeep Switchback concept vehicle is equipped with an assortment of Mopar and Jeep Performance Parts for the 'ultimate in off-road performance'. These include a front and rear Dana 44 axle, a 4-inch lift with Remote Reservoir Fox shocks, heavy-duty cast differential covers, 10th Anniversary steel front and rear bumpers, Rubicon winch, grille, winch guard and cold air intake. An axle-back exhaust, 17-inch concept wheels and 37-inch BFGoodrich Mud-Terrain KM2 tyres increase the off-road capabilities of the Switchback concept. The Switchback exterior features a concept hood and half doors, topped off with a concept “Safari” hard top and roof rack system. The exterior also includes Jeep Performance Parts high-top wing flares, Mopar black fuel door and tail lamp guards, and Jeep Performance Parts swing gate hinge reinforcement and oversized spare tyre carrier. With an LED off-road windshield light bar, the concept also has LED off-road A-pillar lamps, LED tail lamps, and Jeep Performance Parts LED headlamps and fog lamps. For the Jeep CJ66 the US-based brand took a Wrangler TJ frame, hung a 1966 Jeep Wrangler CJ universal 'Tuxedo Park' body on it, added in Wrangler JK elements, and powered it all with a Mopar 345 Crate HEMI Engine Kit-enabled 5.7-litre HEMI - to make the narrow-bodied Jeep CJ66 concept. The CJ66 pumps out 383 horsepower via its 5.7-litre HEMI engine and a six-speed manual transmission. The Copper Canyon-coloured body stands out, riding high on 35-inch BFGoodrich all-terrain tyres wrapped around functional, Jeep Performance Parts 17-inch beadlock wheels and paired with a 2-inch lift kit. A concept two-way air system lets off-roaders quickly air up or air down tyres to the desired pressure. Looking out from the cropped windshield, the driver and passenger are perched in custom Dodge Viper seats featuring concept seat risers. The cockpit is surrounded by a custom-built roll cage, while a bikini top netting offers shade and cover from the elements. 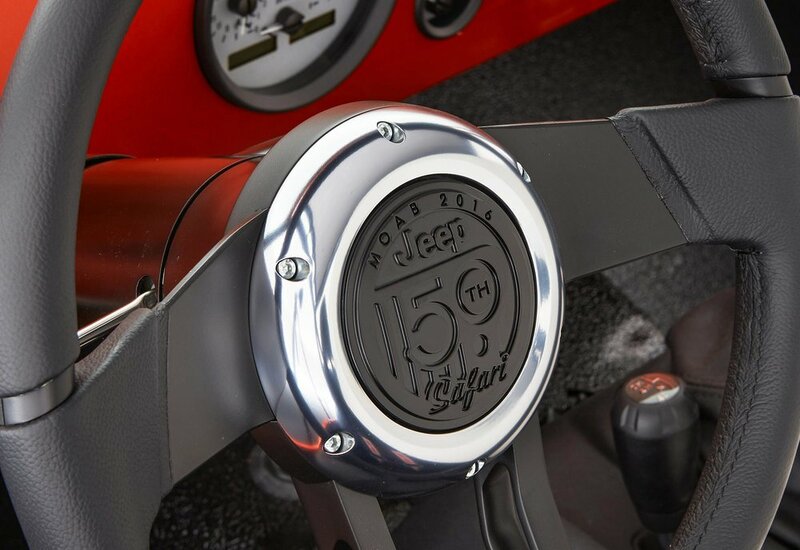 A Wrangler JK centre console and gear shifter, Mopar instrument panel gauges and Mopar all-weather mats complete the interior. This Wrangler-based concept features magnetic underbody rock lights, powerful 7-inch LED projector bi-function headlamps, unique LED tail lamps, A-pillar-mounted high-powered LED spot lights, upper bumper LED auxiliary lighting with cornering fog lamps controlled by the steering angle, and low-profile integrated overhead LED auxiliary spot lights protected behind the windshield. Other features include a roof-mounted solar panel, a drone landing pad with lighted drone and removable spare tyre storage case, and a capacitive touch interactive display on the driver’s side rear window linked to GPS and internet services. 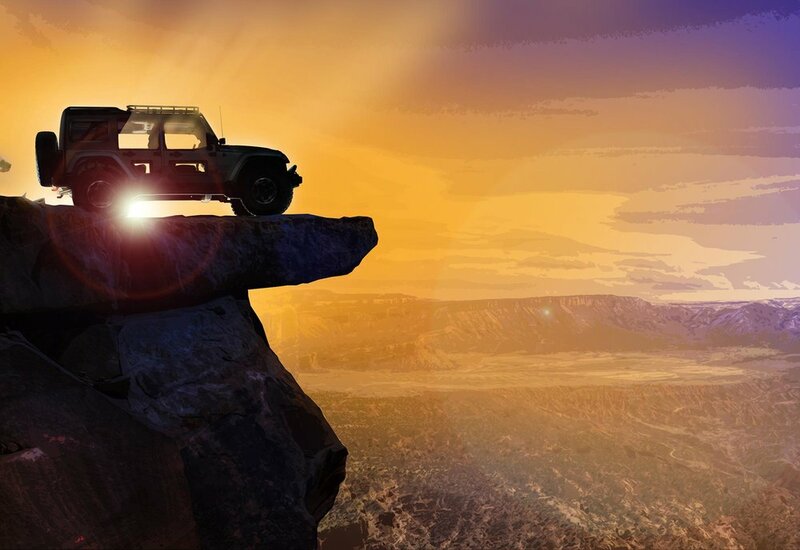 The Easter Jeep Safari in Moab, Utah runs from April 8-16.